Boy George has been part of a few posts here: one of the main musical sense memories I’ve posted here, talking about the impact he had on me as a young music fan and young gay man, opening doors in the world at large and in my mind. He’s also a part of a Christmas post, too. 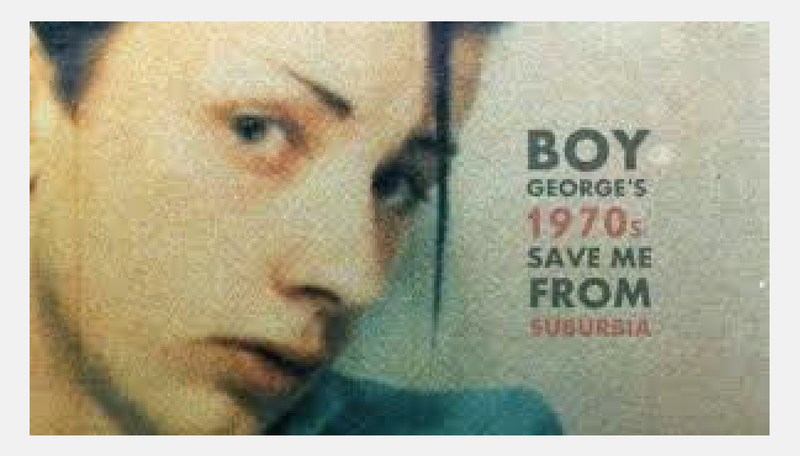 George participated in a BBC documentary, “Save Me From Suburbia,” and he, too, had a few guides that opened his world and his mind, out of the dreariness of 1970s suburbia. It’s available (for the time being) on YouTube here in the States. I’ve always appreciated and loved George. He has been honest and vulnerable in his art and in his life, sometimes at high cost. I found the documentary fascinating, providing some great insights into not just his life but the entire scene. And I loved it when he was crate digging vinyl and playing a Bowie LP. He said something that struck a chord in me, that (and I’m paraphrasing) vinyl records as a physical object are like a talisman or sacred object to many of us. Such an amazing film, Do check it out. I’m glad he’s still here, and that he’s still creating and putting his energy out into the world.